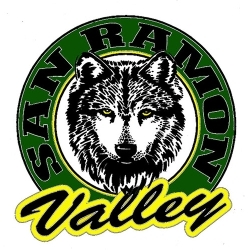 Where is San Ramon Valley High School located? We are located at 501 Danville Blvd. in Danville, California 94526. You can contact the school at (925) 552-5580 or fax us at (925) 838-7802. Exit 680 at El Cerro, west. Continue on until it dead ends and turn left at Danville Blvd. Continue a quarter of a mile. You will see the campus on your right. What is the school ID number? To report a full day absence, call and leave a message on the recorder at 552-3004. For a partial day absence, call 552-3001 (student last names A-Gi), 552-3006 (student last names Gl-Or), or 552-3014 (student last names Os-Z). Please visit https://www.srvhs.net/apps/pages/index.jsp?uREC_ID=57144&type=d&pREC_ID=126612 and follow the proceedures listed. As a reminder, there is no cost to current students but there is a $5 charge for alumni transcript requests. How do I register my student to attend your school? ﻿Please visit https://www.srvhs.net/apps/pages/index.jsp?uREC_ID=57144&type=d&pREC_ID=584844 for registration links and information. How can you sign up for SAT? The sign ups for the SAT and ACT tests are online. For SAT go to www.collegeboard.com. For ACT go to act.org Students should come in to the career center for more information and to check out the preparation books we have for the tests. The San Ramon Valley Unified School District is excited to announce a new way to pay for school meals; it's called School Cafe. You can now make secure online payments into your student's school meal account, as well as view all of your student's transactions and balance 24-hours a day. For your protection, the School Cafe Online payment website uses the most up-to-date security components available in the banking industry; all data transmitted is encrypted and authenticated every time you use the website. Your credit card information is used only to process your deposit and is never stored on any website computer. For each deposit you make you will receive an on-screen receipt to print out as well as an email to verify the deposit. Click here for more information.